Good Monday morning! Notice anything new and exciting here? Yep, a brand new look for The Enchanted Home. I went through Debby of Inspired Design, yes that talented sweetheart whose middle name should be “patience”….she was patient with me like you cannot imagine. I had a vision in my head and did my best to translate it to her…and after a lot of back and forth exchanges, sure enough it came to fruition! SO first a big thank you to Debby for helping me realize this vision. I just love it and am a big believer in changing things up every now and then. If you have been contemplating a new look or need help just to give a little facelift to your own blog or site, you should absolutey contact Debby, she is fabulous with a capital F, super talented, beyond nice and just a gem in every way. Hoping everyone had a wonderful weekend. Here, it was picture perfect weather wise…gorgeous about 60 and sunny! My little party was so wonderful, and even with more people than I planned it was still fabulous……and plenty of leftovers (best part, right)? Anita is a newer blogging friend, but her warmth and vivaciousness shine through in a big way. I have decided I could live on her front porch alone. It is just so beautiful, the vistas, the way she has decorated it…is a total dream. Then you step inside and see the talent just overflows. What a treat to see inside her beautiful home and get to know a bit about the process and how she thinks when it comes to decorating, clearly all she is doing is right on the money, she truly has such a fabulous eye. I will be guest posting over at her blog in a few weeks so stay tuned for that! Enough of me, lets hear from Anita……. 1. How long have you been in your present home? Is this it for the long haul? Anything you would care to change if you could? wood sash windowspedestal and claw foot tubsfarmhouse sink48 inch pro gas rangebuilt-in stainless refrigerator unit and freezer unitreclaimed hardwoods butlers pantryvessel sink in guest bathbuilt-in cabinets to hide large flat panel TVopen concept living room/kitchen7 foot kitchen islandhanging barn doors to study Then there’s the Round Top ranch. 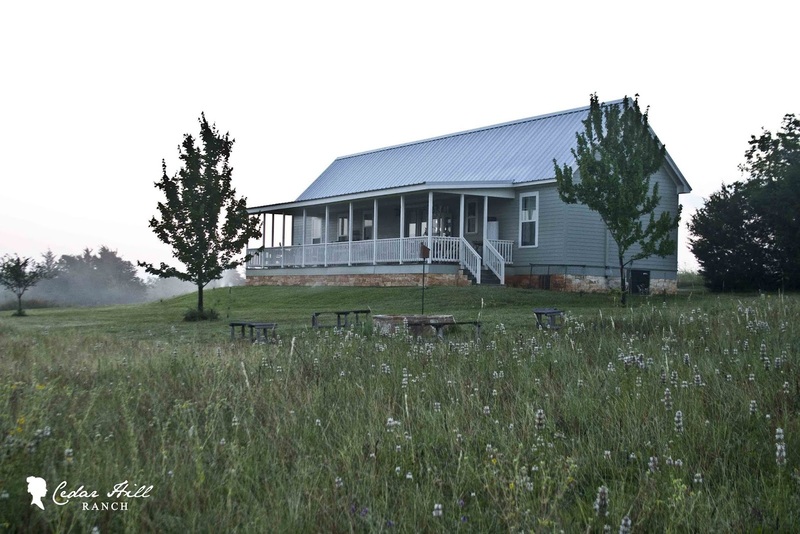 The house at the ranch is fairly new. We had it built in 2009. We love it so much, that yes we plan to keep it for as long as we are on this earth. 2. If you could only live in two rooms of your house, which two would they be? Oh Tina, that would have to be my living room and my bedroom. These are the rooms I worked the hardest on to transform from deep reds to a calming neutral palette. 3. How would you describe your decorating style? It’s what I call Farmhouse French. 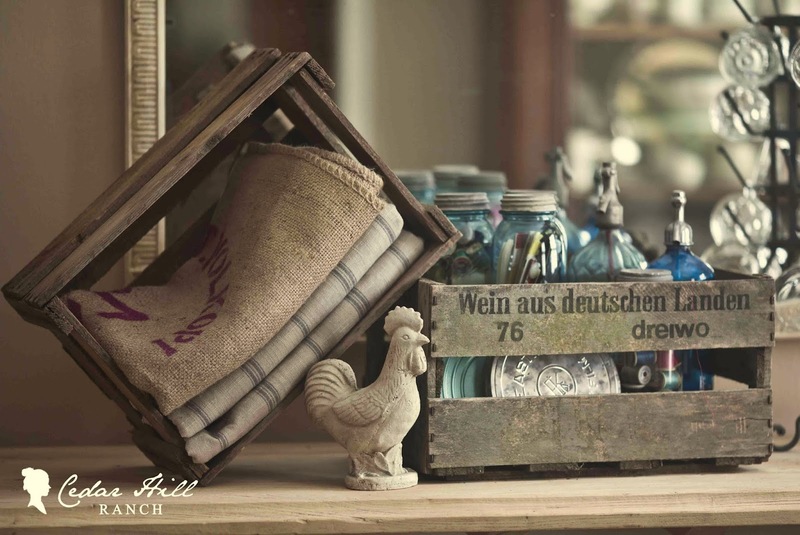 That’s a mix of fine French elements like curvey French chairs, vintage silver, dishes, and other pretties, along with with rustic country elements like unfinished wood, and lots of baskets and rusty things. 4. Do you have a favorite color scheme? What is it? My family thought they would NEVER hear me say this, but I have to admit, it’s white. I LOVE color and have always had lots of it in my home, but I have to admit the calm, soothing effect of white is unbeatable. And now I see what I didn’t before. Colors and patterns come and go. If you decorate with patterns, you’ll need to change them out constantly to keep from looking dated. 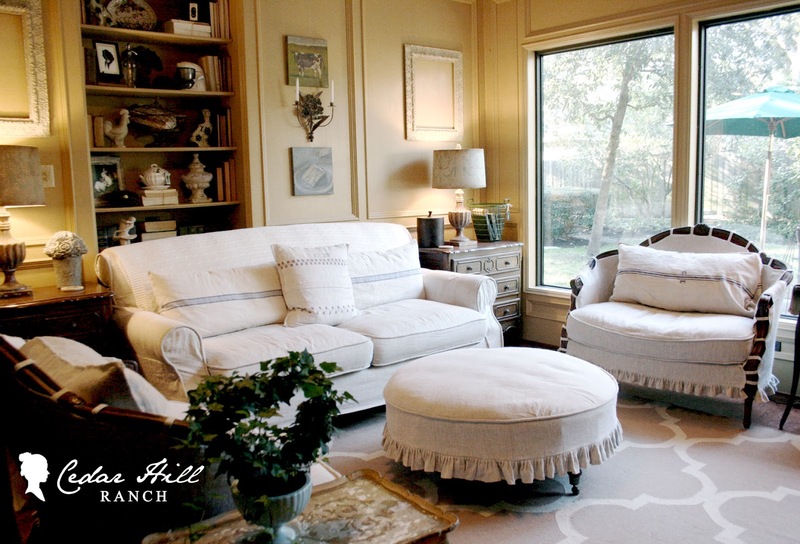 White linen slipcovers are like the black dress of decorating – always in style and they go with everything. I’ve made my own linen slipcovers and bedding to go with my new look. 5. Favorite room of your house and why? My favorite room in the house is also my favorite place to be on earth… seriously. 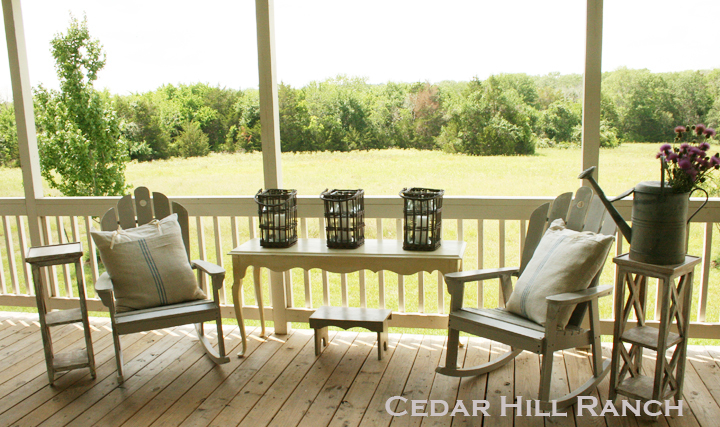 If you read my blog, you probably already know the answer… my back porch at the ranch. 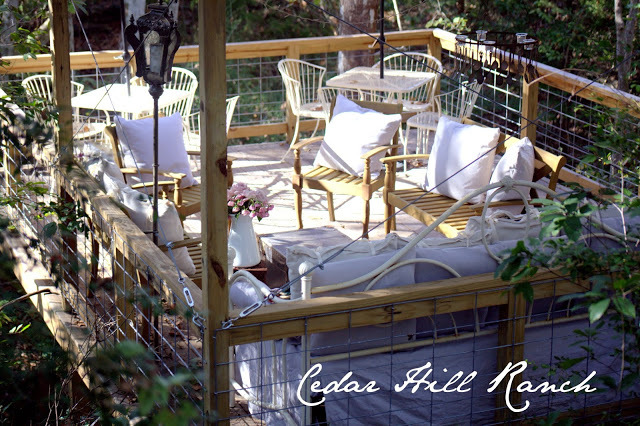 With a daybed I covered in linen, vintage grain sack pillows and lots of rockers, it is a comfortable place to take in the cool breezes. I bought an antique pine table for our outdoor dining room, that can seat 10 in a pinch. Then there’s our breakfast room table at the other end of the porch. Here I’ve set a table with bluebells from our fields. The chairs are vintage folding chairs from France. Did I mention I hauled an inherited china cabinet from the city back here? Notice the chandy? My friend Peggy was about to give that to the Savlation army because it didn’t work. I converted it to a candle burning chandy and hung it back here. But the best part about the back porch is that we have these amazing views. 6. Best two tips you can give to anyone looking to tackle the decorating of their own home? If you need help, ask for it. Post your question on Hometalk, Facebook or ask a blogger for advice. I get the best advice from readers and other bloggers. Secondly, just do it. Most changes are reversible, so it’s not the end of the world if you mess up. The wrong purchase can often be returned, sold, or moved to another room. Paint mishaps can be painted over. I’ve made mistakes, but almost always I am able to inexpensively correct them, and I learn in the process. Best two things to NOT do? 1. If it’s remodeling – like moving a wall or new flooring, I recommend getting a professional, unless you really know what you are doing. Badly done home remodeling can really hurt your home value.2. Don’t buy it unless you LOVE it. I have gotten rid of so many things, and do you know what they all had in common? They were “bargains.” A bargain is something marked down for sale that you wouldn’t normally buy, that no one else wants either. These are the things you bring home because they are the right price, but you’re not crazy about them. Unless you can make them over, don’t buy them. It’s not a bargain to buy something you don’t like that you will likely give away soon. 7. What do you think are the most important features for a kitchen? I would say this has to do with personal taste. For me, the two things I was looking for in my new kitchen were that it be open to the living room, and that it have a big island. These are two features I don’t have now. 8. How do you like to dress up a cocktail table and console in a living room? This is a funny question, because I don’t have either in my living room. We have an ottoman rather than a coffee table. I do have a large console in my dining room, so I’ll address that one. I love changing things out for the seasons here, but my favorite way to dress it up is with fresh flowers. You just can’t go wrong with fresh flowers. 9. Any advice on the subject of lighting? Well, having owned a portrait photography business for many years, I can tell you that lighting is critical to a good photograph, so I probably look at lighting more closely than most. I would avoid any fluorescent lighting, including CFL’s. It has a greenish cast that you may not notice until you take a photograph without a flash. The other advice I have would be to use lots of lamps. They add more ambiance to a room than overhead lights. During the day, I prefer natural lighting, so I open all of the shades, and soak up the sunlight, but at night I use lamplight mostly. 10. Do you have a favorite paint color? Do tell! 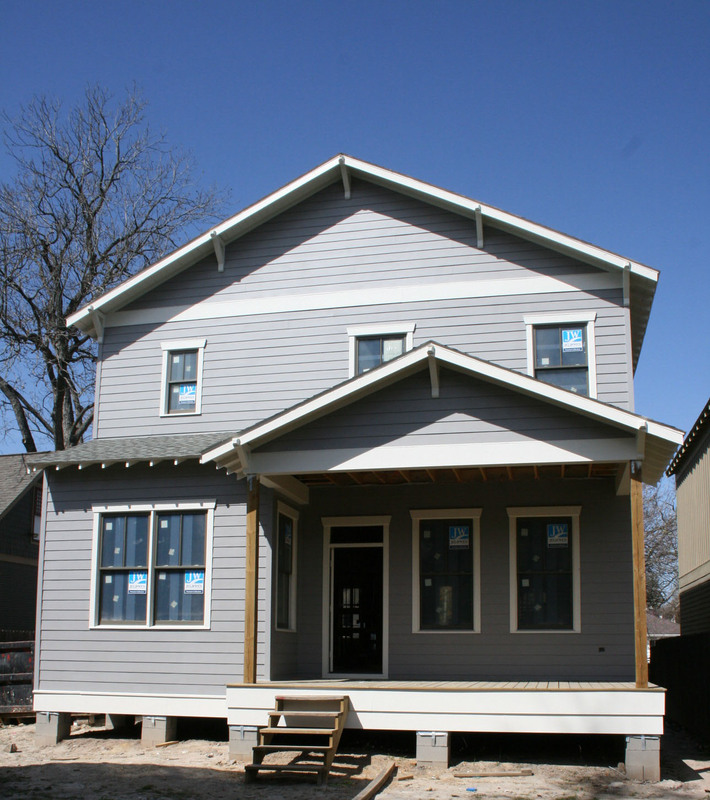 I’m loving Sherwin Williams Collonade Gray. I haven’t used it yet, so I don’t have any photos of it, but that is my top choice to use on our new house. I used Sherwin Williams Windsor Greige exclusively at the ranch for all of the interior rooms. 11. 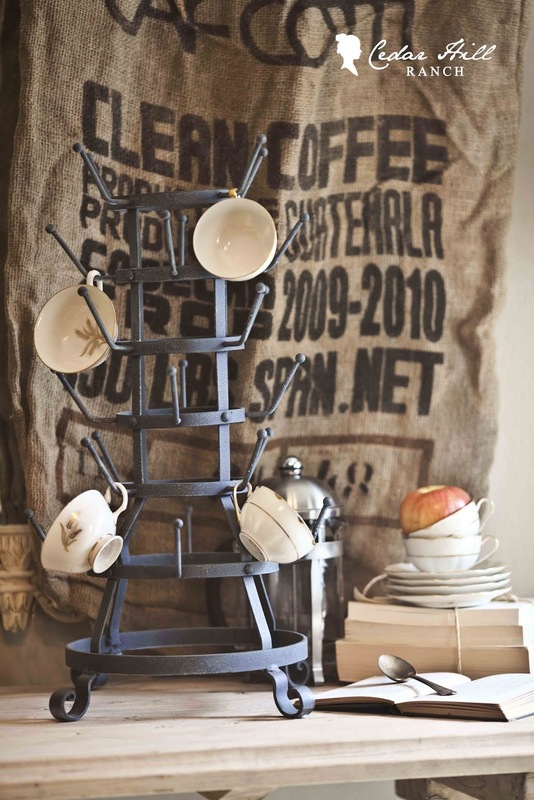 What are a couple of really simple inexpensive things you can do in your home to make it feel “homey” and inviting? 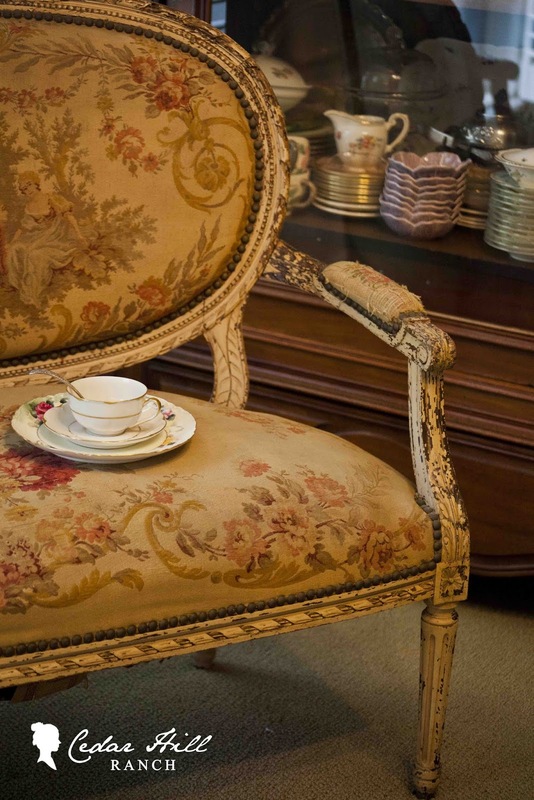 Vintage items and antiques add a charm and warmth to a room that is difficult to achieve otherwise. 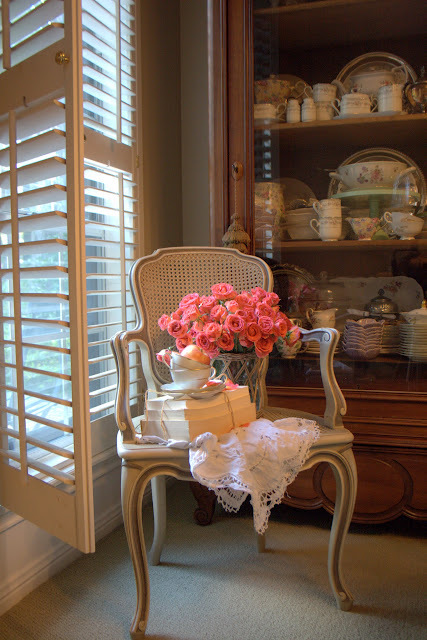 To add warmth, I also love to add old worn baskets and antique chairs. 12. Fill in the blank- If money was no object, the very first thing I would buy for my home would be…………. That’s easy, a Louis XVI wedding armoire. I have it on my list, so I’m hoping to get one after we move. Thank you Tina for inviting me over for the interview. You had so many great questions. 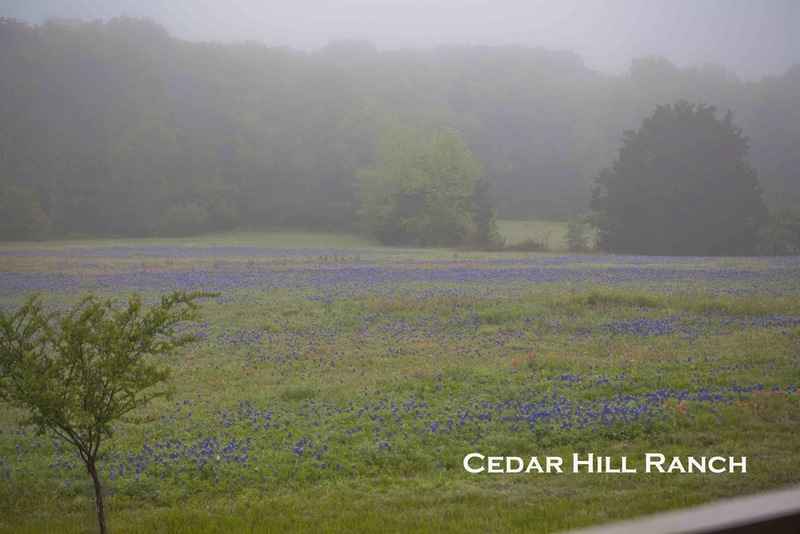 If you want to see more of Cedar Hill Ranch, come over any time. If I don’t answer the door, I’m on the back porch! Is this the most amazing treehouse you have ever seen? A grown ups version….I would live there! 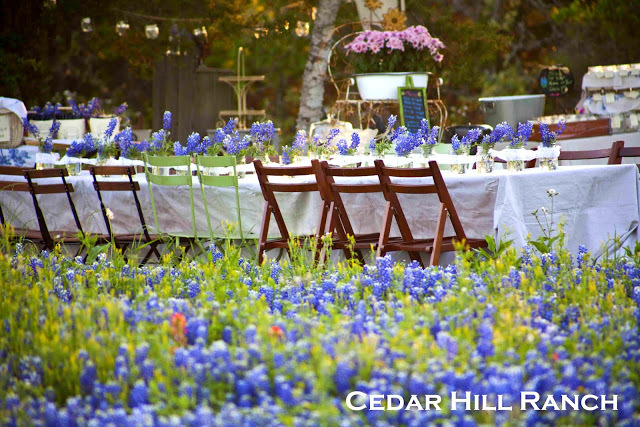 I want to attend one of her countryside soirees…as pretty as a postcard! Like a Monet painting…its so pretty! Amazing, don’t you think? These bloggers just have me awed by their talent…and what fun because they each represent a totally different style yet each is so incredible beautiful. I think I have enjoyed this series more than any other and I cannot thank Anita enough for her kindness, generosity in opening up her home and for her extraordinary talents. Anita, you truly live a charmed and beautiful life! Thank you for this and thank you to all the readers for stopping in. Want more Anita? Please visit her over at her blog to say hello and tell her how much you enjoyed this. If you don’t follow her already, you should…its like a daily dose of beauty. Click here to visit. Thank you for coming by and wishing everyone a wonderful day and great start to the week!! It’s a darn good thing that addresses are not part of the blog;) This is exactly what happens when someone decorates to their own standards and stays true to their unique perspective. Gorgeous. PS. Love the new look! beautiful home and gardens! LOVE anita’s style! This was a delight Tina! I love this series! What a wonderful home and I feel as though I know Anita now after seeing it. The porch would also be my favorite space as I love being outdoors and dining al fresco for me is heavenly – always my first choice when possible. Thank you for the introduction, Tina! Thank you, Tina, for the introduction! Such a beautiful home and person. You are such a sweet soul. Thank you so much for inviting me here to share my home with your readers. It was so much fun!! AND I look forward to seeing you on my back porch.. well if not in person, at least virtually. Wow! I’m loving her home and your blog, Tina! Gorgeous design!! Her home is a dream! It seems peaceful and oh, so comfy! Truly inspiring! This is such a perfect post for Monday morning Tina! Anita’s home is *beautiful*, my word, what a fabulous eye she has! Even more importantly, her skill in carrying out her vision is superb. It’s great to see you are having some springy weather finally, I think you will have more this week! Tina, thank you so much for featuring Anita. She is a darling and wonderful as you would imagine. Her personality comes through in her immense talent for decorating and photography!!! Anything she does makes me sigh! She is one of the few people that does french right…. and makes me say ooh la la!!! What a great way to wind down this fabulous series!!! xo to both of you! Love your new look, Tina! Thanks for introducing me to Anita. Great to meet another TX girl, and with a French flair to boot! Have a great week! 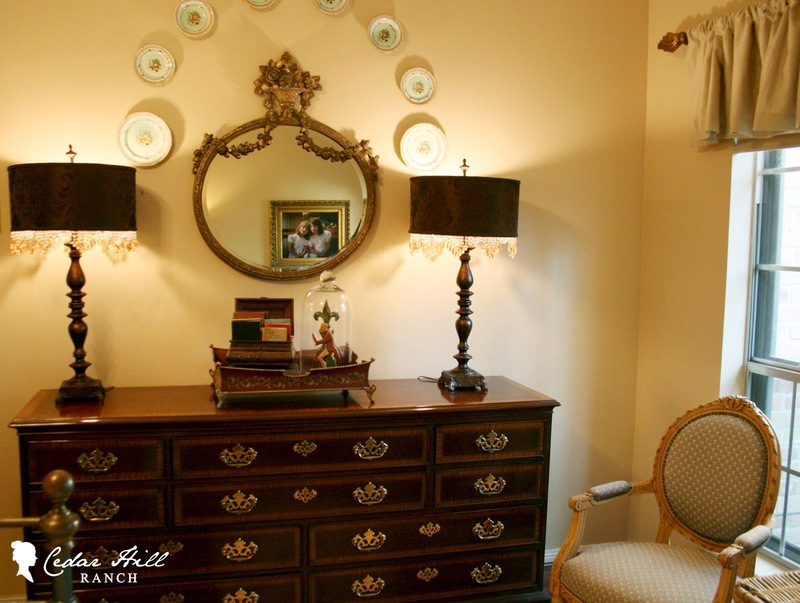 Everything Anita touches turns to a welcoming space. The warmth of her personality comes through in her decorating. So pretty and romantic! 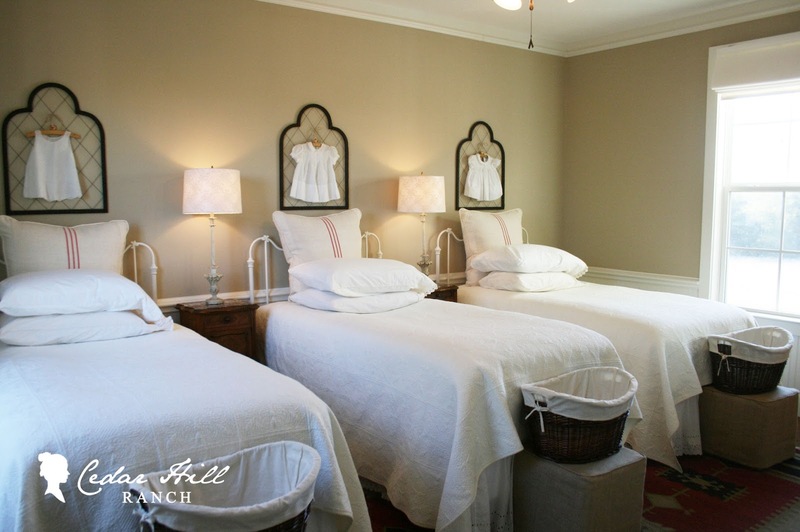 I absolutely love the triple twin beds with baskets at their footboards–so sweet and stylish. Lovely post! 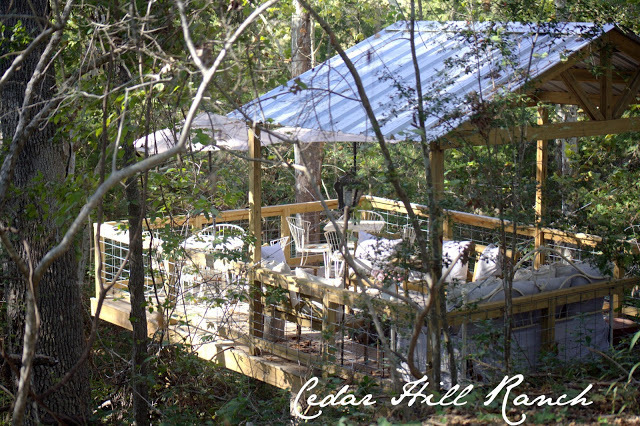 As a Texas gal, I am completely enamored with Anita’s Central Texas get away! The bluebonnets and sunsets in Texas just can’t be beat and Anita has designed a home to take full advantage of them! Ahhhh…white. So clean and crisp and a perfect color for a place that can really feel the heat. 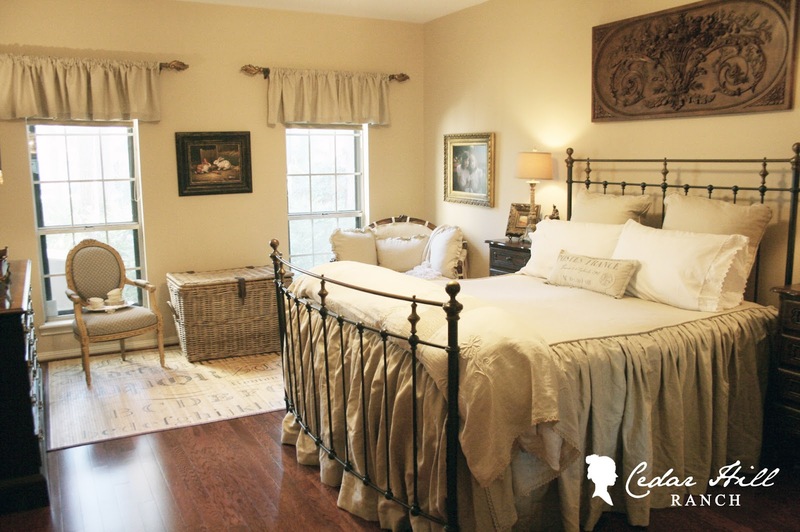 That guest room with the 3 twin beds is just the cutest ever!!! And, that tree house. I’ve never seen anything like it. Thank you so much for introducing us to this inspiring woman! Congrats on the new “look” and thanks for sharing Anita’s beautiful home. I love the triplet beds! Gorgeous in every way, I can tell she loves her home with not only her words but with the beautiful manner in which she has designed and decorated it. I am dying for that tree house, how fun is that! Love the fresh look of your pretty blog, Tina! Tina first love the new look, it is so “you. Elegant and classic. This home is amazing. I agree I would be happy just to live on that porch. And that treehouse! I have never seen anything quite like it. She has beautiful taste and such a knack for putting it all together. 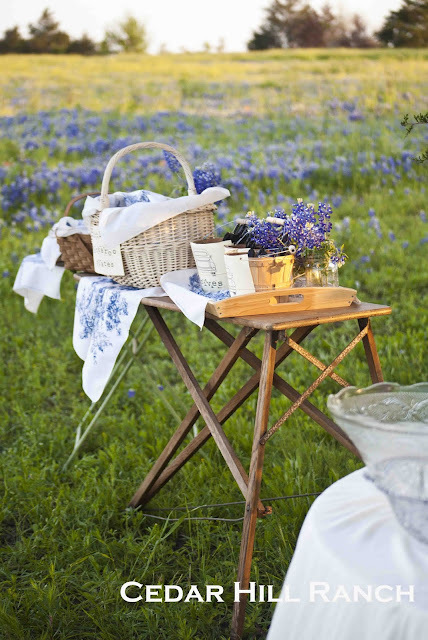 Those last pictures of the table set in the field of bluebonnets reminds me of what a special place the country is and how much I miss it! Wonderful wonderful post! Thank you for the introduction Tina. I have yet to visit her blog .. I’ll pop right over. Such a lovely country French home. The bedroom with the three beds is beautiful. Lots of fun details in this home and such beautiful property! This is a perfect example of someone who really loves her home and has taken great care to create an atmosphere that is not only pretty to look at but so warm and inviting. I am just in awe of her talent and cannot get over that treehouse! I would convert my home office to it, haha. Tina, this series has been such fun, getting a inside view into so many beautiful homes. I hope you will going with it! Also love the new blog look. Its just beautiful! Wow, this is so beautiful. Its like living in a storybook. I love every one of her rooms and that front porch is so gorgeous, perfect for an afternoon nap! Thanks for introducing me, happy to follow her now. I love how she uses baskets and fresh flowers, both things everyone can do. Lovely lovely post. Anita is one of my favorites. She and I are kindred spirits with the French style. Her photos are amazing and so is her home. She is an asset to the blog world! Absolutely delightful. A very talented lady! 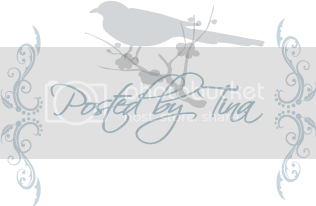 Thanks Tina and Anita and Tina, love the new blog look! Tina, I love your new blog look! It is fabulous! As for Anita, I have been a fan of hers for a while now and think here style is beautiful. I love seeing her creativity and the building of her new place. Looking forward to your party pictures! Oh my word, this is so incredible. It looks right out of a magazine. I am surprised Victoria magazine is not beating her door down. I love the entire vibe and seriously I felt my blood pressure go down just looking at these beautiful images. I can’t get over that treehouse! Just amazing in every possible way. Thank you! Tina, i love the new look of your header – so glad to see the pictures of your home – looks like they belong in a magazine.. Thanks for always putting so much detail and effort into your posts, we your followers are spoilt. Anita’s home is beatiful. Such talented ladies! Thanks ladies. Anita’s home is always such a beautiful place to wander through :-)Luv her style. charm charm charm everywhere. 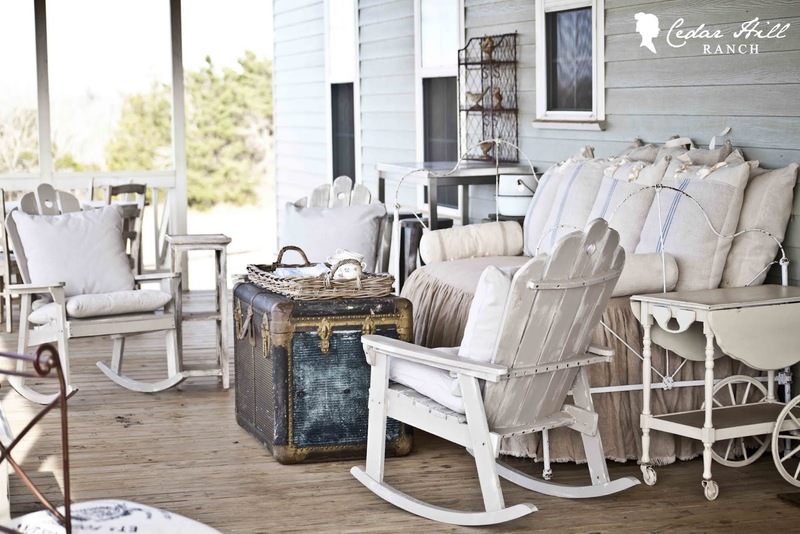 my favorites are the repeated linen slipcovers and the mix of rustic farmhouse chic. bravo, anita! What a beautiful place to call home. I am in love with that front porch and think I would while away all my time there with a good book and my laptop. That treehouse is unlike anything I have ever seen. 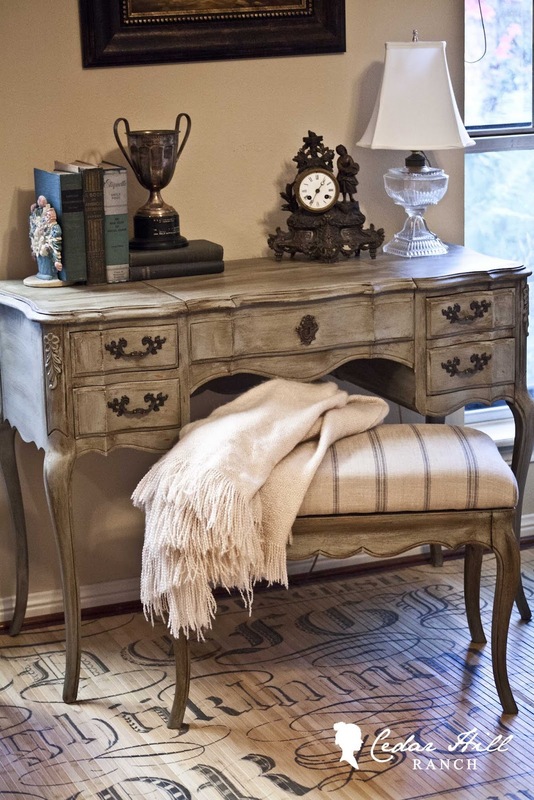 Quite beautiful and all the slipcovered furniture represents one of my favorite looks for lack of a better word, “shabby chic” I love her French/farmhouse feel. It is magical. Thanks for sharing. Love the new blog design Tina, so reflective of your gracious and elegant style! Thanks for sharing so much beauty. It hard to know where to begin everything. This is so beautiful. It is like opening up a favorite design maganzine what a talent Anita is! I would love to know if she trained and went to school for interior design, its hard to grasp that someone is that talented without proper training. Loved her tips too. Good practical advice for us “novices”. Tina, thank you for featuring her and also I love the new look of your blog, just lovely! Her home is so pretty…love her style! Such a pretty light-hearted style. It looks like spring! This home is so fresh and inviting. 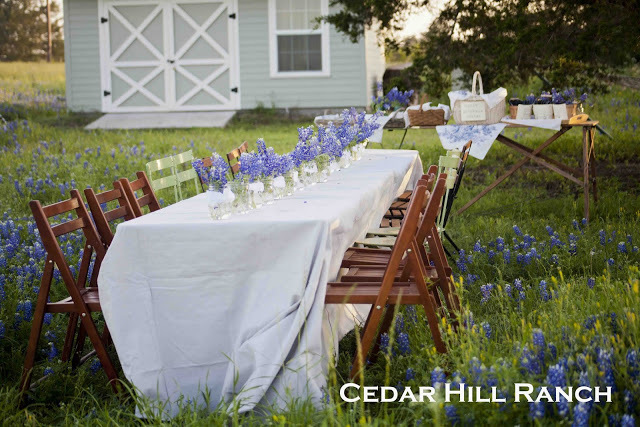 And, that treehouse…and the table set for the outdoor dinner party. I would love a place like this to escape to! The new site looks great!!! Tina love your new look here … so gorgeous and elegant! Anita’s home is so beautiful and that treehouse!! WOW … I also really love the slipcovers that she makes herself … fantastic… thankyou for sharing and I too could sit on the verandah or sit at the dinner party under the stars! Tina- this was such a great idea, to get to go inside your talented friends homes. This one is a total charmer. I feel more relaxed just looking at this post after a long day commuting for almost 3 hours, country living sounds REALLY good right now! I like her attitude about trying things and taking chances and am going to look into Hometalk, never heard of it. Last, I love your new blog. Its so beautiful and quite enchanting! 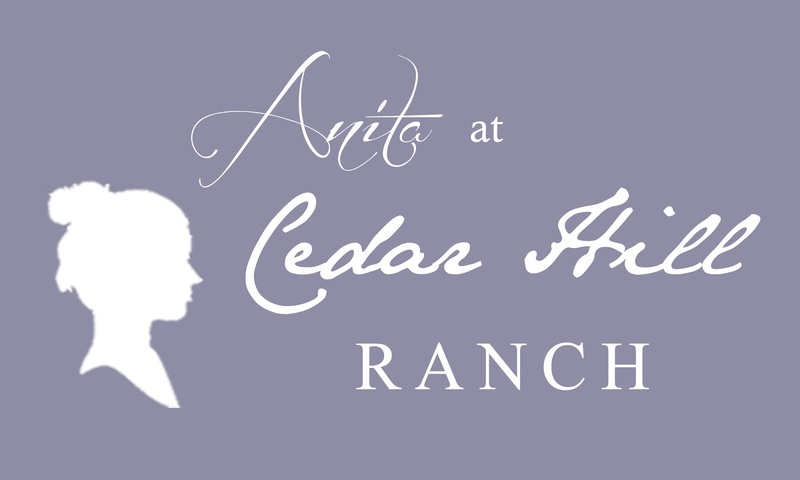 Love Anita’s ranch and glad to hear about her blog! I love your new look and know I need to get Debby to help us out as well! Debby is so talented! Loved seeing what she did with your blog look! Thanks for sharing! Tina, thanks for featuring Anita’s beautiful home. She is such a talented gal and as dear as they come. I look to Anita for inspiration. I admire her creative ideas and style. 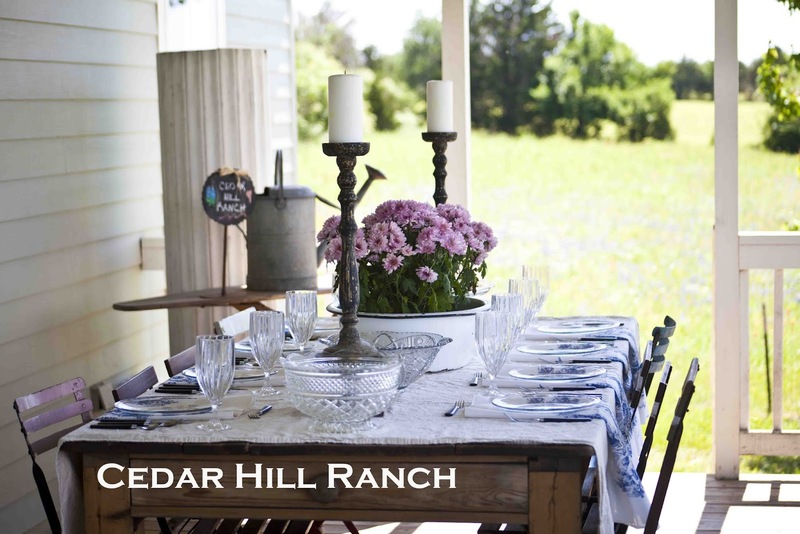 Her ranch in Round Top is fabulous! I’m really enjoying this lovely series and it’s such a pleasure being allowed into the homes of your favourite bloggers. Such a treat. Love this home! It would be so fun to own a ranch! Lovely at it’s best! Thanks for sharing! Awesome inspirations. I have a house for the first time and I’m slowly but surely filling with beautiful antiques and decor from Europe!